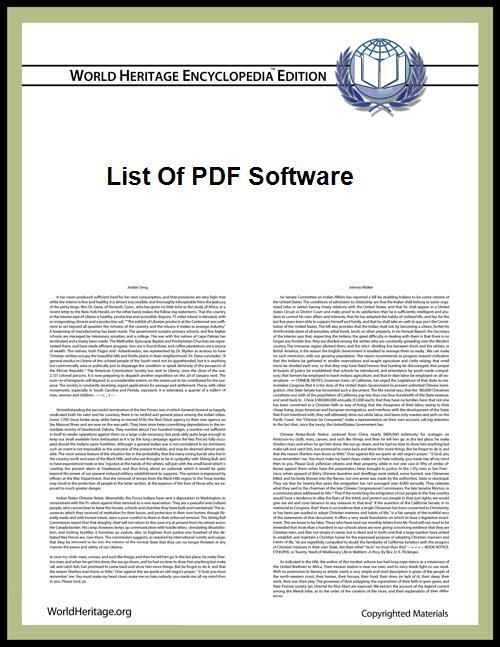 This list of PDF software includes links to articles on software used to manage Portable Document Format (PDF) documents. These allow users to convert PDF files to other formats. LibreOffice GNU LGPLv3 / MPLv2.0 Linux, Mac, Windows Import from PDF (extension included by default), export as PDF including PDF/A. OpenOffice.org GNU LGPLv3 Linux, Mac, Windows Import from PDF (with restrictions) (after installing an extension), export as PDF including PDF/A. These allow users to modify an existing PDF file. LibreOffice Draw GNU LGPL Windows, Mac OS, Linux PDF viewing and editing. Has many of the features offered by Acrobat. Karbon LGPL and GPL Windows, Mac OS X, Linux, BSD, Solaris/Illumos Import PDF with multiple pages as layouts, export as a one-page PDF. All standard vector graphics editor features. These are used by software developers to add and create PDF features. PDFBox Apache License Java developer library for creating, view, extract, print PDF files. Foxit PDF SDK Proprietary License C/C++ library that can create, edit, and view PDF files. JPedal Proprietary, GNU LGPL Java developer library for viewing, extracting, and printing PDF files. PDFTron Systems Proprietary License C, C++, C# .NET, JAVA, Objective-C, Python, Ruby and PHP library for creating, editing, annotating, optimizing and viewing PDF files. These create files in their native formats, but then allow users to export them to PDF formats. These allow users to view (not edit or modify) any existing PDF file. Evince GNU GPL Universal viewer for GNOME. Foxit Reader Proprietary, freeware PDF Viewer / Reader for Desktop computer and Mobile Devices. Allows users to add many elements to PDFs (e.g. arrowed comment boxes, text boxes, links, bookmarks, and images). MuPDF GNU GPL Aims to be small and fast with high quality anti-aliased graphics. Qiqqa Proprietary, freeware View PDFs in a variety of zoom layouts, annotate, tag, search, cross-reference. Xpdf: a multi-platform viewer for PDF files, Amiga version uses X11 engine Cygnix. Okular: Supports a range of annotation types. Annotations are stored separately from the unmodified PDF file, or (since version 0.15 with Poppler 0.20) can be saved in the document as standard PDF annotations. Xournal: Allows for complex and customizable annotations by freehand drawing, a shape recognition tool, multiple colours and text fonts. In addition, there is a rule tool for straight lines, highlighting and underlining. Annotations may be copied, pasted and easily moved. Annotations may also be in complex scripts such as Tibetan through SCIM input. Annotations are stored separately from the unmodified PDF file, but the annotated document can be exported to PDF. Evince: Supports addition and removal (since version 3.14 ), of basic text note annotations. The CUPS printing system can render any document to a PDF file, thus any UNIX/Linux program with print capability can produce PDF files. Pdftk: can merge, split, en-/decrypt, watermark/stamp and manipulate PDF files. PDFSaM: can split, merge and mix PDF documents, encrypt and decrypt them, set metadata, permissions and viewer options, extract attachments, add front and back cover and rotate pages. poppler-utils: includes command-line tools to extract images from a PDF (pdfimages) and convert a PDF to other formats (pdftohtml, pdftotext, pdftoppm). ps2pdf: converts a PostScript file to a PDF. SWFTools: its pdf2swf component converts PDF to SWF. Xournal: an open source program that creates PDFs. Scribus: an open source program for professional page layout. Xournal: free (GPLv2) GUI tool which can annotate PDF files and save and print the results. Adobe Reader: Extant freeware versions are obsolete, Adobe has stopped support for Linux. Evince: default PDF and file viewer for GNOME; replaces GPdf. Okular: KDE desktop environment; replaces KPDF. Xpdf: for the X Window System. Xournal: GTK2 PDF viewer and annotator using Poppler. Zathura (document viewer): Lightweight document viewer with vimlike keybindings. MuPDF: Free lightweight document viewer. Safari: This bundled web browser has built-in support for reading PDF documents. OmniPage: Converts to and from PDF and other formats with many options. Qiqqa: Converts Microsoft Word document and Web Pages to PDF. SaveasPDFandXPS: Freeware add-in for Microsoft Office 2007; converts documents in standard Microsoft Office formats, e.g. Word, Excel, Powerpoint, into PDF format. Bullzip PDF Printer Freeware Virtual printer, requires Ghostscript and PDFPowerTool. CC PDF Converter GNU GPL Virtual Printer. Creates a PDF with embedded Creative Commons license from any software. Bundled with optional proprietary Razoss adware and browser tools. CutePDF Freeware and professional versions Virtual printer, also with proprietary PDF editor. Attempts to install the Ask Toolbar as well as Hotspot shield. Can be avoided by using the /no3d command-line switch. deskPDF Standalone Available for both client and terminal servers. doPDF Freeware standalone Virtual printer. It doesn't use Ghostscript. Includes adware. gDoc Creator Shareware Enterprise-level creator to create, review, edit, share or archive PDF and XPS documents. After 30 days shareware version places a watermark on documents. HelpNDoc Freeware and professional versions Manual and documentation authoring tool with native PDF export. Free for personal use. Nitro PDF Reader Freeware reader; commercial full version available As with Adobe Acrobat, Nitro PDF Pro's reader is free; but unlike Adobe's free reader, Nitro's free reader allows PDF creation (via a virtual printer driver, or by specifying a filename in the reader's interface, or by drag-'n-drop of a file to Nitro PDF Reader's Windows desktop icon); Ghostscript not needed. PDFCreator FairPlay, GNU GPL Virtual printer for Windows using a custom license called FairPlay. Used Ghostscript GPL until v1.7.3. Now uses .NET Framework 4. Includes adware. PDF-XChange Free lite version PDF Tools allows creation of PDFs from many types of source input (images, scans, etc.). The PDF-XChange print driver allows printing directly to a PDF. A "lite" version of the print driver is free for non-commercial (home and academic) use. PrimoPDF Freeware standalone Virtual printer, for Microsoft .NET Framework and uses Ghostscript and RedMon. Connects with www.primopdf.com. Includes Open Candy adware. Universal Document Converter Proprietary, Commercial Virtual printer. It doesn't use Ghostscript. HTML2PDF-X: Proprietary software library for PDF creation from HTML input. Adobe Acrobat: Adobe Systems's proprietary desktop PDF authoring suite. Adobe Photoshop: Adobe Systems's Graphic Design software and image editor. gDoc Fusion: proprietary/shareware desktop product to create, review, edit, share or archive PDF and XPS documents. After 30 days a watermark is placed on documents in shareware version. Nitro PDF Pro: a proprietary commercial PDF creator/editor with an interface styled after Microsoft Office; replicates most or all features of the Adobe Acrobat full commercial version; offers a separate freeware reader (which also supports PDF creation, annotation, collaboration and signing); Ghostscript not additionally needed. PDF-XChange Viewer: Freeware PDF reader, tagger, editor (simple editions) and converter (free for non commercial uses). Solid PDF Tools: Convert PDFs into editable documents and create PDFs from a variety of file sources. Microsoft Word 2013: Proprietary desktop software. The 2013 edition of Office allows editing PDF files. Adobe Reader: Adobe's PDF reader is free only for personal use. For commercial use, Adobe Reader should be purchased. For instance, if your software uses Adobe Reader for things like printing, you and your customer will have to purchase Adobe Reader if it qualifies as a commercial product. Evince: a free (GPL), open source PDF reader. Part of the GNOME desktop environment. Windows port available since version 2.28. Foxit Reader: Proprietary/freeware PDF reader, supports FDF import/export, saving filled forms; other extended functionality available via purchasable plugins. gDoc Fusion: Proprietary/shareware to view PDF, XPS, Microsoft Word document, Microsoft Excel spreadsheet, Microsoft PowerPoint presentation or image files, included in the evaluation version of the product. Shareware version places a watermark on documents after 30 day eval. Javelin PDF Reader: A full functionality PDF reader with support for DRM using encoded and encrypted PDF files in Drumlin's DRMX and DRMZ formats. Nitro PDF Reader: Freeware (though proprietary) PDF reader and creator. Supports three methods (specifying the file within the reader's interface, or dragging-'n-dropping a file onto the reader's Windows desktop icon, or "printing" to a virtual printer driver) of PDF creation (Ghostscript not additionally needed), saving filled forms (AcroForms), text typewriter, markup/collaboration, and stamp signature (document signing). Nuance PDF Reader: Freeware (adware) PDF reader, supports saving filled forms, partial support for XFA forms; enables the capability to convert PDF files to MS Word or Excel files through Nuance website. PDF-XChange Viewer: Freeware viewer with free OCR, supports FDF/XFDF import/export, saving filled forms, extended markup and export to image capabilities. Qiqqa: Freeware PDF reader, indexer, tagger and annotator. Supports OCR and export of PDF text and images. Sumatra PDF: A free (GPL), open source PDF reader. It also supports DjVu, XPS, CHM, Comic Book (CBZ and CBR) and eBook (EPUB & MOBI) file formats. Supports automatic reloading of PDF files. STDU Viewer: A freeware for non-commercial usage PDF reader. It also supports DjVu, Comic Book Archive (CBR or CBZ), XPS, TIFF, TXT and image file formats. PDFVue: a free web application that allows the user to view PDF's, comment and fill PDF forms from a web browser. Generates a watermark. A.nnotate: a web service which views PDF documents as HTML in the browser, with annotation features. DigiSigner: free online PDF viewer java applet with additional function to digitally sign PDF documents. ^ iText: licenses, iText Software Corp.
^ "Licensing". Libharu.org. 31 August 2008. Retrieved 2012-07-29. ^ Kristian Høgsberg (27 February 2005). "The poppler pdf rendering library". cgit.freedesktop.org. Retrieved 2012-07-29. ^ "Bug 151614 - store annotations with documents". ^ "Annotations are being improved". ^ "Learn Acrobat X – Converting PDF Files to Other File Formats". Adobe TV. Adobe Systems. 17 October 2010. Retrieved 22 October 2011.